1 extra lean pork loin all fat removed. I would have always used shoulder of pork but I now find for my diet it is too fatty. 1 tsp of sweetener/brown sugar/honey whatever is your preference. 150mls or half a carton of passata. 4 tbsp of smoky bbq sauce or ketchup. 2 sticks of celery chopped in half. About 2 hours before you place the pork loin in the slow cooker I make the dry rub, place it on the pork and rub all over and leave it soak up all the flavours. Add the celery and onion into the bottom of the slower cooker to raise the pork off the bottom. This will also add flavour to the sauce at the end. Place the pork loin onto the celery and onion. 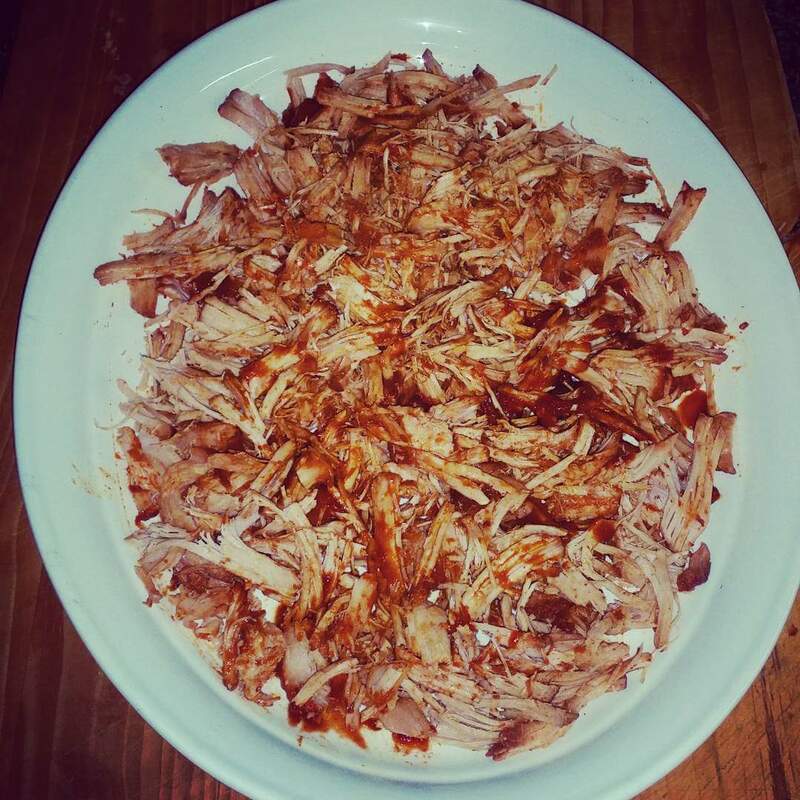 Add the boullion to the 150mls of boiled water and place over the pork, add the passata, bbq sauce or ketchup, garlic powder, paprika, to the slow cooker and stir to combine. I place a teatowel over the top and then add the lid on top of that, this will stop any excess water caused by condensation to drop back into your sauce which would result in a watery sauce. Leave to cook for 2 hrs on high and then for a further 6 hours on low. This is also perfect to cook over night and if cooking overnight just leave on low. You will be left with beautifully tender and succulent pork meat. Which you will be able to just pull apart with a fork. For the sauce I strain through a sieve so you are left with a concentrated smooth sauce. (You don’t want bits of celery and onion floating around it) The sauce will keep in the fridge in a sealed container for up to two weeks and 3 konths in the freezer. To reheat I add it to frying pan with a couple of teaspoons of bbq sauce and a the same of water to create steam and fry until steaming hot. This will take literally 2 minutes. You can serve on a high fibre bun with salad and red cabbage slaw. 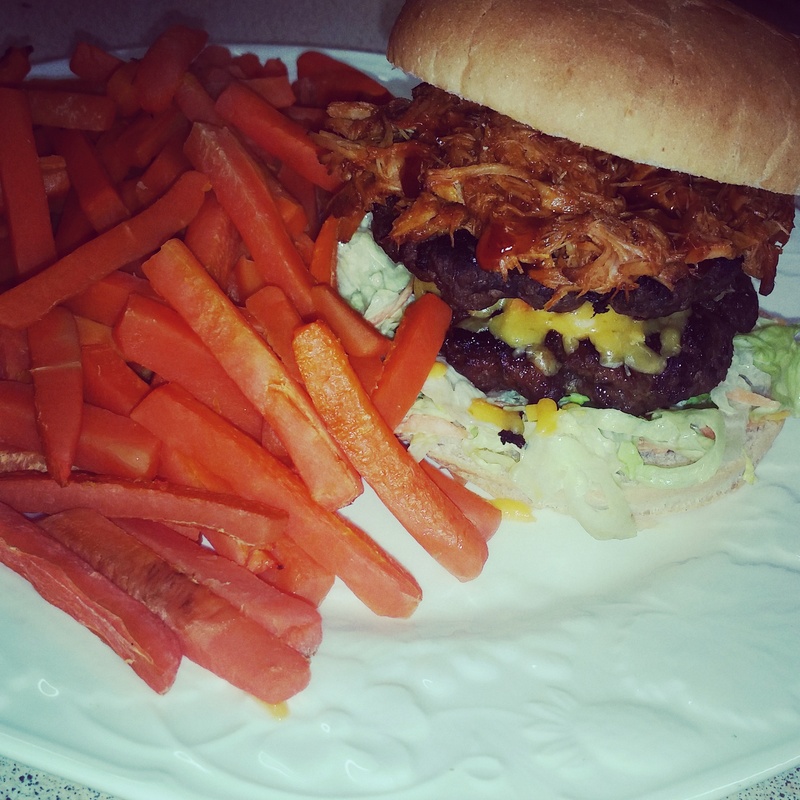 Or like I did below, a BBQ pork double beef burger with cheese and homemade slaw. AMAZING! !